In honor of Art Basel, this week’s edition of our Key Piece series celebrates Swiss artist Alberto Giacometti. 1. Alberto Giacometti was born in 1901 in Val Bregaglia, Switzerland. 2. His corpus encompasses high and thin sculptures representing the sensation he felt while looking at a woman. 3. Giacometti is one of the most famous surrealist sculptors. He closely worked with Picasso, Max Ernst, Balthus and Joan Miró. 4. His models were close relatives such as his sister Zaccaria Giacometti and fellow artist Isabel Rawsthorne. 6. In 1958, Giacometti created his largest sculptures entitled Grande femme debut I for the Chase Manhattan Bank building in New York. He decided on his own not to submit his works to the Chase Bank commission. The sculptures belong now to several private collections. 7. He was awarded the grand prize for Sculpture at the Venice Biennale in 1962. 8. Both Giacometti and his sculpture L’Homme qui marche I appear on the current 100 Swiss Franc bills. 9. His Man Pointing broke the record in May 2015 when it was sold for US$141,3 million at Christies and became the most expensive sculpture ever sold. 10. Giacometti’s works can be admired in prestigious international museums such as the MoMa, Tate and Guggenheim. Alberto Giacometti, Three Men Walking, Foundation Beyeler. 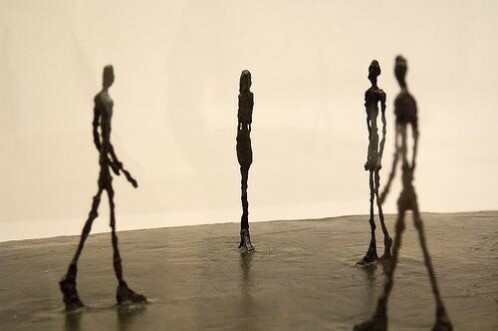 Alberto Giacometti, L’homme qui marche, 1950.